Trinity students have been campaigning for the college to divest its financial holdings in fossil fuel companies. On Monday they will be in London for events to mark Global Divestment Day (watch this space). On Tuesday lunchtime they will turn their attention to the Dáil to highlight the fact that the Government has €133 million of our money invested in tar sands and coal through the Ireland Strategic Investment Fund. We're joining these inspiring student activists outside the Dáil at 1pm on Tuesday for a photo stunt. If you can make we'd love to see you. Divesting taxpayers' money from fossil fuels is now a key demand of the Stop Climate Chaos coalition and featured heavily in our "Meet your TD" event on November 15th. Over 150 constituents meet with 80 TDs. Altogether 53 TDs and Senators signed our letter to Minister Noonan to divest the Ireland Strategic Investment Fund from fossil fuels, 53 backed our demand to Minister Ross for greater investment in walking and cycling, and 60 asked Minister Naughten to ensure a fair payment for solar electricity. You can see which of your local TDs signed our ask letters here. It was great to see our policy demands reflected when Minister Naughten's first "Transition Statement" was debated in the Seanad and the Dáil this week. This annual moment of parliamentary accountability is a new requirement under the climate law passed last year. Unfortunately the Minister's own statement was a bit of a "damp squib". We can only hope he was keeping his powder dry for the launch of a draft 5-year climate action plan next week. You can retweet the tweet below to let him know the Government's plan needs to deliver a rapid and just transition to a fossil free future. 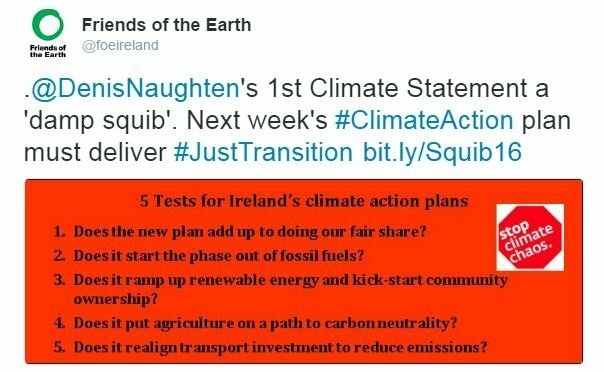 And Stop Climate Chaos have "5 Tests for Ireland's climate action plan". The long awaited EPA research on fracking was finally published last week. It was undermined by the fact it was carried out by consultants with close ties to the fossil fuel industry. Even so it identified enough uncertainty for Minister Naughten to make it clear he supports a ban on fracking, as he told RTE's Morning Ireland. This outcome is a real tribute to the grassroots campaign in Leitrim and beyond to make fracking politically unacceptable. The Irish Times saw the Minister's announcement as the end of the road for fracking in Ireland, but we won't rest until the Bill to make it illegal becomes law so the campaign is far from over. 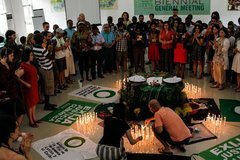 Freinds of the Earth activists around the world are on the frontlines of the fight against fracking, fossil fuel extraction more generally, and a host of cross-cutting environmental and social justice issues. Our Chairperson, Cara Augustenborg, is just back form the general meeting of the federation of 75 national Friends of the Earth groups. Her blog on the experience, "Finding Hope in a Room Full of Broken Toys", is well worth reading in these challenging times. We know from experience that by joining forces and campaigning strongly, creatively and persistently, we can win. P.S. Our campaigning depends on you. Your support makes it possible, and your participation makes it powerful. Thank you.